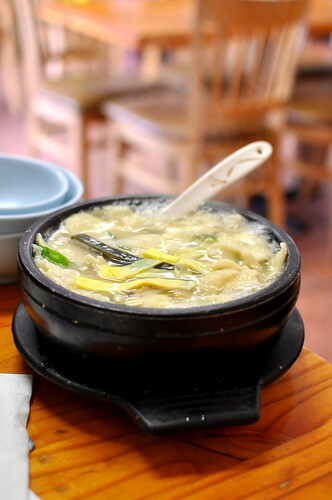 While we’re on the topic of Koreatown, let’s discuss the awesomeness of Mapo Kkak Doo Gee! 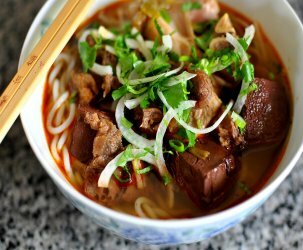 I was first introduced to this gem while researching The Food Lovers’ Guide to Los Angeles a few years back. 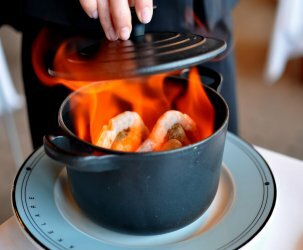 In a neighborhood full of stellar restaurants, I keep returning here time and again for the dependably delicious cooking. 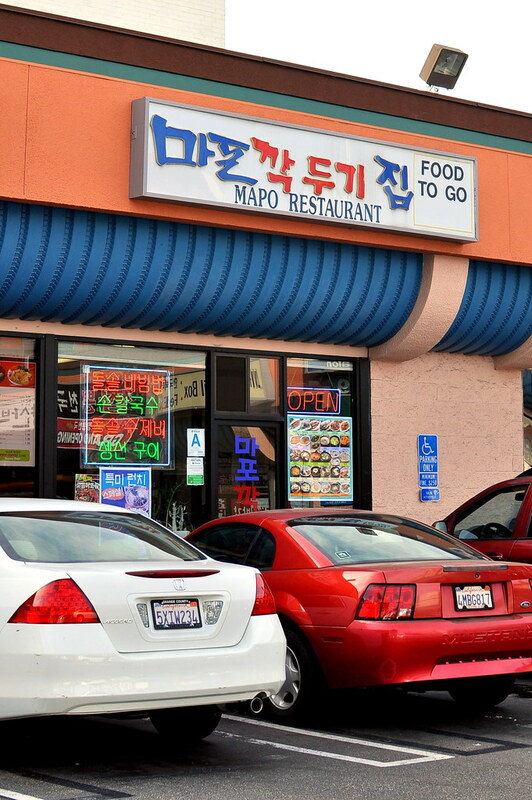 As you can likely deduce from the facade, Mapo Kkak Doo Gee is a no-frills kind of place. 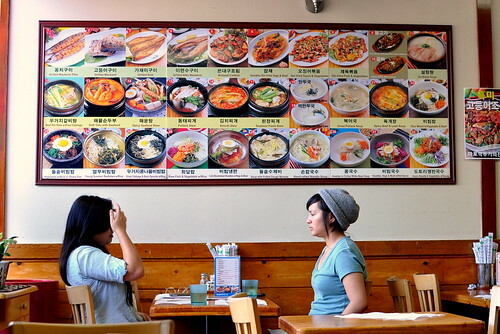 The menu features homey Korean fare, and seats are easy to come by at both lunch and dinner. 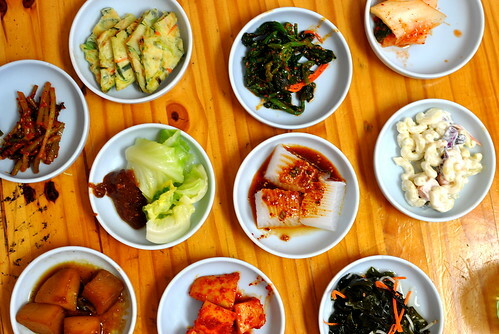 One of the perks of dining in Koreatown is the free and refillable banchan served alongside every meal. While it’s always nice to receive something for nothing, it’s rarely the case that these pickled and marinated nibbles are as memorable as the main course. 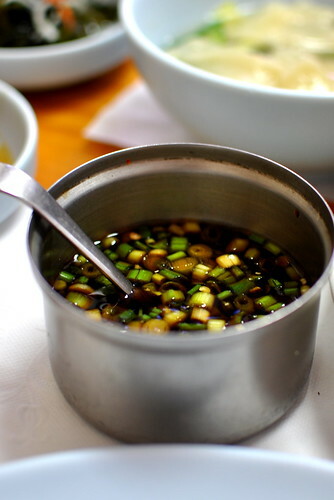 At Mapo, however, the banchan are so remarkably good that my chopsticks can’t help but reach for more. 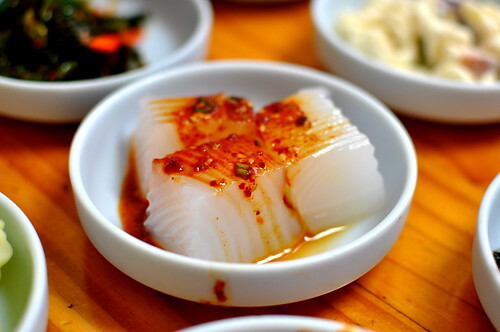 There are always several varieties of kimchi, as well as macaroni salad, acorn jellies topped with soy sauce and scallions (pictured above), pickled seaweed, boiled cabbage with gochujang (fermented red chili paste), and pancakes. Seconds and thirds are all but guaranteed. 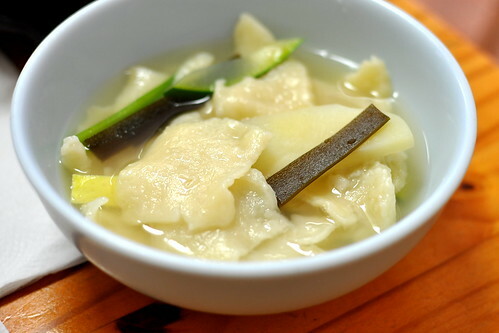 The “flakes” of dough are wonderfully rustic and appealingly thick and chewy, while the light broth brings pure comfort. 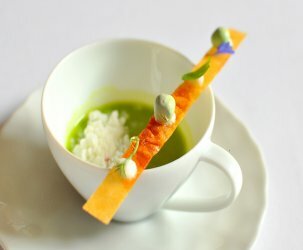 Make sure to ask for the scallion-soy sauce condiment, which is a lovely accompaniment to the subtle soup. 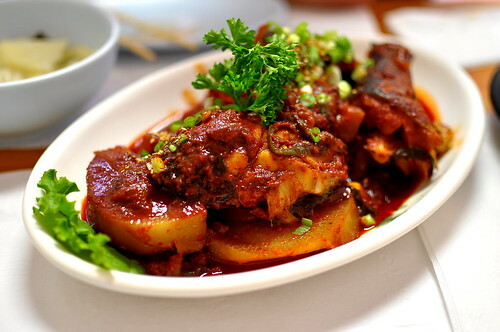 Another must-order is the restaurant’s braised fish: both the mackerel and cod are superb. I love how this preparation keeps the fish’s flesh tender while imbuing it with the intensity of gochujang. It’s a flavor bomb and then some! Even daikon, a mostly yawn-inducing root, comes to life in this flavorful preparation. Eat with plenty of rice. Four years ago: Baked & Wired – Washington D.C.